Leveraging the information already resident in your people and company may be one of the most effective things you can do to decrease waste, increase productivity and even the longevity of your people’s commitment to the organisation. Is a reluctance to change holding you back? In most cases, people are busily getting on with what they do in the way they’re most comfortable. And that just happens to be the way they’ve always done things. A natural resistance to change (or uncertainty), coupled with the tendency not to do things until they have to be done (which is often too late), can result in errors and inefficiencies that seem to be built into the system. Many companies struggle with instituting change, let alone a practiced philosophy of continuous improvement. Yet, as we move at a faster pace and competitive advantages become more and more focused on efficiency, making change on a regular basis and constantly improving is almost essential. According to Hunter Dean, a Knowledge Management expert and Lean Enterprise consultant at Systemix, the role of business leaders today is as much about providing vision and the traditional aspects of leadership as steering an organisation toward effective knowledge management and leveraging learnings. “Organisations that can truly learn from their experiences, both good and not so good, become very smart, very fast. This gives them confidence and agility which makes them very difficult competition”, Hunter explains. 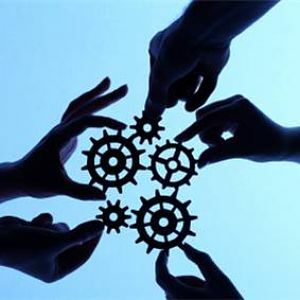 Knowledge management and actively leveraging learnings are both critical factors at an organisational and project level to competing successfully in today’s market. So how do you approach this in your business? Your servers and people are no doubt full of information. But unless this information is retrieved, managed, shared and integrated in an effective manner it cannot translate to knowledge. They will still be using it still in six months? That new recruits or people in other business areas will learn this too? They will still be using and refining this information in 2 years or 5 years? Knowledge is something that is resident in the company, not just the people or one or two divisions. It’s like the corporate wiki that everyone turns to and learns from. 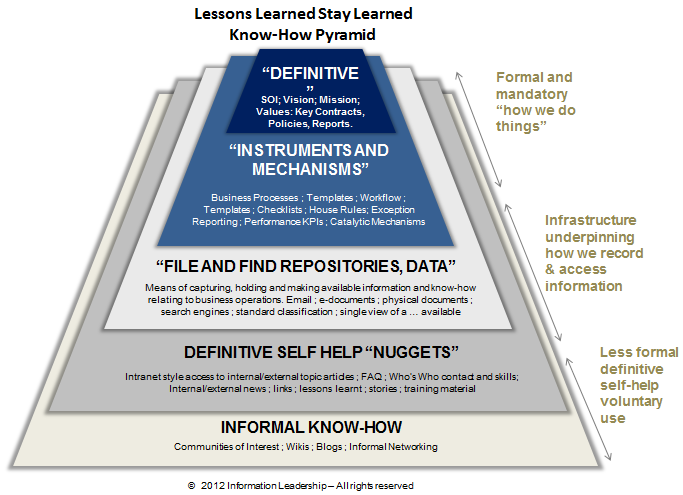 Working through the pyramid, Systemix move organisations from the informal know-how space to the ‘definitive’ space where knowledge now underpins the fundamental functions of the business. The process to achieve this involves the thorough investigation of either a project team or organisation as it is now in relation to the pyramid. This will reveal critical insights into the areas where knowledge is seeping away and how it can be harnessed more effectively. Then, through collaboration and communication, people can see the insights for themselves and design a new pyramid to work toward. “Once we have communicated the insights we gain from this process, we focus on training and developing a roadmap to strengthen the method for learnings staying learnt,” says Hunter. 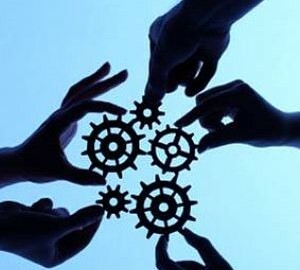 Through tightening business processes and workflows, implementing mechanisms to drive improvement, measuring the right things, making information more available through hard systems and zeroing in on key messages to communicate, an organisation or team can quickly become ‘smarter’ and more effective in a short space of time.